On paper, this is yet another good day for a strong break to make it all the way. With 38 KOM points up for grabs, this is also an important stage for the riders targeting the polka dot jersey. However, after three days of winning breakaways, the GC riders may want to get in the mix for the stage win this time. The peloton starts out climbing as soon as the official start is given. After a short ascent, a long section of false flat awaits before it’s time for the first categorized climb of the day. Puerto de San Isidro is set to be 11 km long with an average gradient of 3 %. However, the low gradients are primarily due to a downhill section halfway up the climb. If the break hasn’t be established already, this is most likely where it will happen. From the top of the climb, the riders take on a long descent of nearly 30 km before they start climbing again. The 5.3 km towards the top of Alto de la Colladona have an average gradient of 8.1 % with parts of double-digits gradients at the bottom. A short loop including Alto de la Mozqueta (6.5 km / 8.7 % avg.) comes after the descent before the riders reach the intermediate sprint in Blimea. Soon after, they start on Alto de la Falla de Los Lobos (5.3 km / 6.4 % avg. ), which top comes with just 21 km to left to go. After the descent, it doesn’t take long before the final struggle of the day begins. The run-in towards Alto Les Praeres is up and down and after a fast but technical descent, the riders start on the actual climb. The road is narrow and the gradients are steep right from the beginning. In total, these final four kilometers of the stage have an average gradient of 12.5 % and parts of nearly 20 % towards the top. 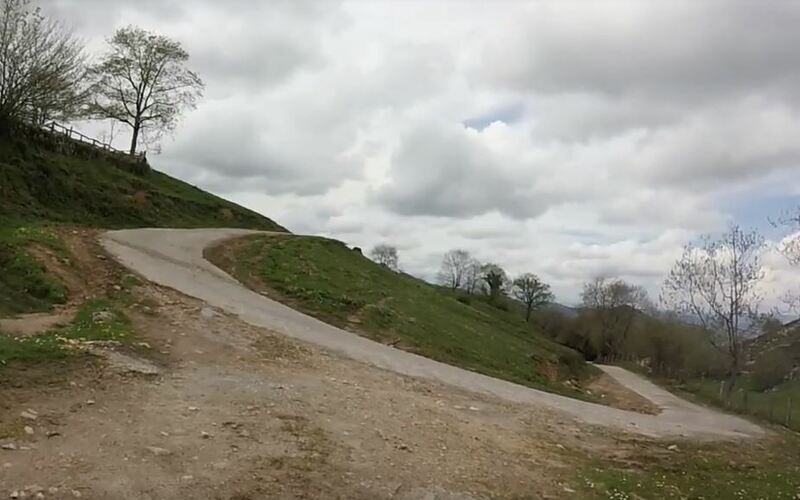 Especially, the last hairpin corner is excruciatingly steep as you can see on the image below. After the corner, the last 150 meters are straight-out towards the finishing line with 9.5 %. The view from the top is spectacular but the riders will most likely be too out of oxygen to even sense their surroundings. The final hairpin corner before the finishing line. Photo: Cycling Lorenzo / YouTube. Given the nature of the final climb, once again we need to focus on strong climbers with a good punch on the steep gradients. Personally, I think that the GC riders want to go for the win today. The stage offers over 3000 meters of climbing and many of the ascents have steep sections. If the peloton keeps the pace high, the break will have a hard time making it all the way. Movistar seemed very eager to set up Nairo Quintana on stage 13 and the Colombian also proved to be the strongest of the GC contenders. When in top condition, Alto Les Praeres suits Quintana very well. He may not have the best kick of the climbers, but the power he puts in the pedals uphill is often enough to create a gap. It will also be very interesting to see how Movistar will use Alejandro Valverde. Being just four seconds behind Quintana in the GC, it would be great to see Valverde launch an attack on the penultimate climb, prompting Mitchelton-Scott and Astana to use their riders to chase. Either they catch Valverde and then Quintana goes on the final climb, or Valverde sails away and wins the stage. Usually, Movistar is more fond of playing defense than offense but it would be refreshing to see them try something creative on a difficult stage like this one. The steep gradients also suit Simon Yates perfectly. Unlike Quintana, Yates has a killer punch, which he proved several times in the Giro earlier this year. He was the only one able to follow Quintana on La Camperona and it won’t be a surprise if he pulls off a win today. The same can be said for Miguel Ángel Lóepz. Yesterday, he was extremely unlucky to drop his chain on the steepest part of the final climb. Afterwards, he quickly tried to bridge back to the leaders but he still ended up losing 20 seconds. López is obviously in excellent condition at the moment. Without the mechanical problem, I’m confident he would have been able to follow Quintana and Yates. Knowing that he needs to take back time as quickly as possible, López may use his frustration to fuel a stage win today. Even though it seems unlikely that any of the other GC riders will be able to drop Quintana, Yates and López, it’s not an impossibility. This Vuelta has already been full of surprises and it’s not unusual to see riders overachieving this far into a Grand Tour. Enric Mas showed great legs on stage 13. He likes these short and steep climbs and he has already taking a big win this year. That happened in Vuelta al Pais Vasco when he got the better of Quintana and Mikel Landa and soloed away on the steep percentages on the Arrate climb to win the stage. If the three top candidates are too busy looking at each other, Mas may be able to sneak away and prove too strong to reel back in. As mentioned, the many KOM points today mean that Bauke Mollema, Ben King, Thomas De Gendt and Luis Ángel Maté will be eager to get away. However, since none of them was able to challenge for the win on La Camperona, neither really seem like a good winner pick today. Instead, if a break is to make it, we should look to the likes of Michael Woods and Rafal Majka once again. The Pole seemed just as flabbergasted as the rest of the world after watching Oscar Rodriguez passing him – with ease – to take win on stage 13. Majka usually recovers quickly from breakaways in the mountains and he knows what it takes to make the right break two days in a row. It won’t be easy, but he might get his revenge already today. As you may know, I’ve teamed up with the fantasy manager site Zweeler for this year’s Vuelta a España. Every day during the race, you can create a fantasy team for the stage and play to win cash prizes. The daily prize pool is at 250 Euros for this stage. The more people who sign up and create a team by clicking here, the better the chances are that the previews will continue for the final week of the race. The money made goes to cover server and maintenance costs. Without your help, most likely, there won’t be any stage previews in the final week of the Vuelta.